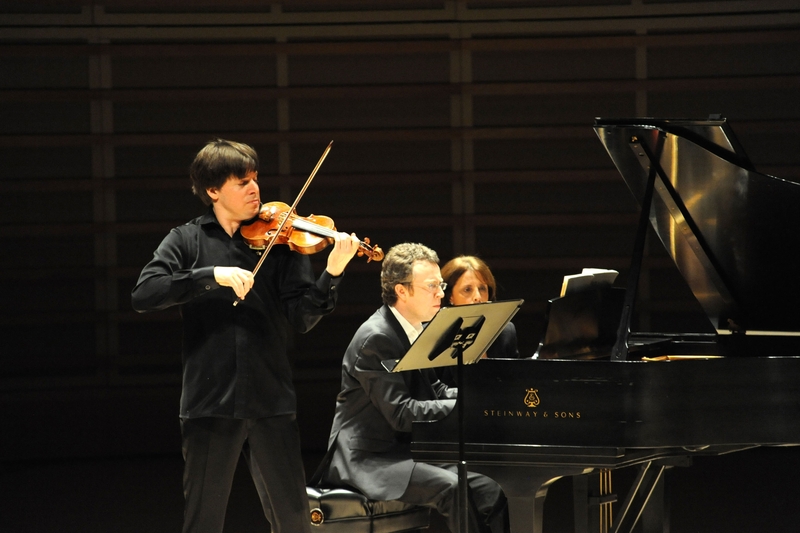 On January 18th, 2011, Adrienne Arsht Center audiences experienced a magnificent evening of classical music as violinist Joshua Bell, together with pianist Sam Haywood, joined forces in a spectacular concert of Brahms, Schubert and Grieg. The recital capped a full evening of activities surrounding this much-anticipated performance. 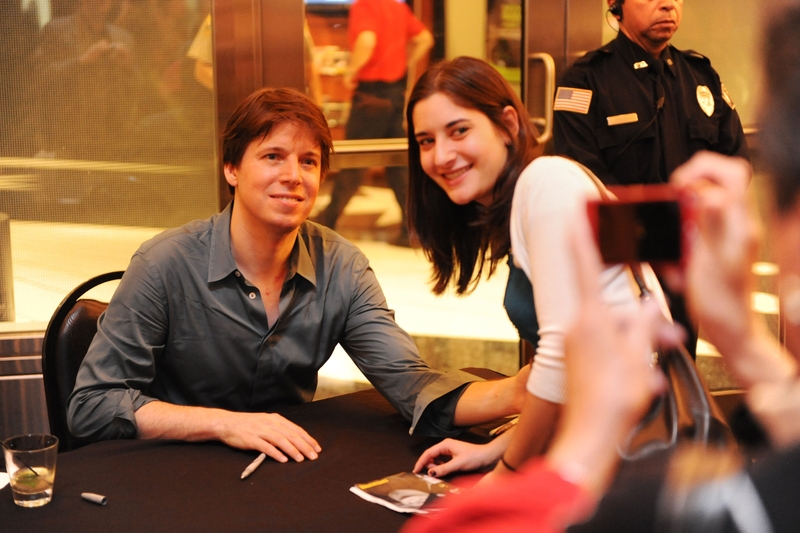 The Adrienne Arsht Center hosted a pre-concert lecture about Bell’s career and his music, featuring host Julie Amacher from Classical South Florida 89.7FM, while immediately following the recital, the Center’s most enthusiastic supporters of classical music, the Encore Circle, were treated to a special VIP reception to meet Joshua Bell inside the Bombay Sapphire Lounge. Meanwhile, a sizable crowd congregated outside in the Thomson Plaza for the Arts to ask the evening’s star to sign their CDs and programs. Mr. Bell graciously accommodated the request of everyone in line, which by the end of the evening, had numbered more than 150. Since his explosive debut at the age of 14 with Riccardo Muti and the Philadelphia Orchestra, Bell has enjoyed an international career as a leading soloist, chamber musician and recording artist. He has been featured on the soundtracks of several notable films, including Iris, Music of the Heart and The Red Violin; the last of which earned an Oscar for Best Original Score. Bell’s popularity spans well beyond the traditional classical music audience, as he has appeared on the Grammy Awards Telecast, “Late Night with Conan O’Brien,” “The Tonight Show,” PBS’s “Great Performances” and VH1. Perhaps his most recognizable performance, though, was the one in which he was purposefully trying to remain anonymous. In January of 2007, Bell teamed with The Washington Post to create a social experiment that has since exploded across the internet, becoming an instant YouTube sensation. At 7:51 AM on January 12, as residents of Washington, D.C. went about their morning commute at the L’Enfant Plaza Metro Station, Joshua Bell (clad in jeans, a long-sleeved T-shirt and a Washington Nationals baseball cap) began playing his 1713 Stradivarius violin, its case at his feet, in which Bell had placed a few of his own dollars as seed money. For the next 43 minutes, Bell played six classical pieces while 1,097 commuters passed by. Of those, only 7 people stopped to listen, 27 placed money in his case (a whopping 32 dollars and change), and only 1 individual recognized him — leaving 1,070 people whose daily routines were undisturbed by one of the world’s greatest virtuosos disguised as a street musician in their Metro station. The experiment was turned into a thought-provoking cover story in The Washington Post by Gene Weingarten entitled “Pearls Before Breakfast.” Weingarten’s controversial piece posed philosophical questions to Americans regarding aesthetic beauty, context, taste level, perception and priorities. It was awarded the Pulitzer Prize for Feature Writing.